Read the latest news about the electronics manufacturing industry and RBB. April 2019 - Members of RBB's marketing team discuss how thought leadership is leveraged in RBB's marketing efforts, with Douglas J. Guth of Crain's Cleveland Business. January 2019 Thank you to the Wooster Area Chamber of Commerce for a great event recognizing many great people and businesses in Wayne County. RBB is honored to be counted among them. Congratulations to all of the award recipients! January 2019 RBB has been named the Wooster Area Chamber of Commerce 2019 Business of the Year. The company began in 1973, in a building in a small hollow on Route 513, just south of Shreve and now operates at 1909 on Old Mansfield Road in Wooster. "Thank you to everyone at RBB and in the Wooster community that helped make this happen. We are greatly honored and humbled to receive this award," said RBB President Jim Tennant. October 2018 RBB will be presented the 2019 Business of the Year Award at the 2019 Wooster Area Chamber of Commerce Annual Dinner, held on Thursday, January 24 in Wooster, Ohio. October 2018 RBB celebrated its 45th anniversary — and a brand new facility — with an open house on Friday, October 19 at the company’s new home at 1909 Old Mansfield Road. August 2018 Please join us in congratulating Amy Hart in her new role as General Manager of RBB. Amy has been a great member of the RBB team for more than 13 years. In that time, her contribution to the company and her support for each team member has shown her commitment and her dedication. July 2018 - RBB's upcoming facility move was featured in The Daily Record. The article explains why the company wants to relocate to the former Bell and Howell building at 1909 Old Mansfield Road in Wooster. Once its lease runs out in August 2018, RBB is moving from its current location on East Lincoln Way in the Rayco Industrial Park to the 90,000-square-foot facility. News about the move was first announced Nov. 2, 2017, at the Wooster Growth Corporation meeting. The Daily Record article was published later that same month. January 2017 - On January 3, 2017, and for only the third time since 1973, a new president took over the reins at RBB. Jim Tennant was promoted from general manager to president. In Tennant’s three years as General Manager, he implemented forward-thinking strategies that improved RBB's customer relations, interdepartmental processes and overall financial health. Tennant has over 28 years of experience in electronic manufacturing and engineering. As president, he oversees sales, operations and corporate services. December 2016 - RBB announced the launch of a new website, logo and tagline as part of a comprehensive rebranding effort that clearly positions the company as a master of its craft—the building and testing of small batch electronic assemblies. This rebranding effort reflects the company's evolution in recent years to streamline its service offerings and focus on its core business of recurring small batch assembly and testing. "We are masters of one thing, and we do it better than anyone. We take your complex designs and build and test your repetitive small batches on demand. And we'll do as many different designs as needed," said RBB's President and CEO Bruce Hendrick. October 2015 - A panel of manufacturing employees from the area who have found success within their careers spoke with high school students to provide further knowledge and insights into the industry and where it’s going in the years to come. May 2015 - RBB President Bruce Hendrick, was honored during a special Smart 50 award celebration held at the Executive Caterers at Landerhaven. As a 2015 Corporate College Smart 50 award recipient, Bruce as well as 49 other top Northeast Ohio execs, were recognized for their outstanding leadership in innovation, impact and sustainability. July 2014 - RBB recently served their "smallest" batch customer to date. Thirteen-year-old Stan Asjes from Nevada, Iowa approached the circuit board manufacturer with hopes of implementing his concept of a pen-sized houseplant gadget. January 2014 - The "Quality Growth" award is presented to a business that has demonstrated commitment to enhancing Wayne County’s economic future and quality of life. RBB was selected because of its transformation from a contract manufacturing “one-stop-shop” to a highly laser-focused niche business that satisfied a specific market need. 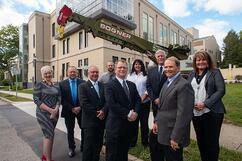 November 2013 - With changes along the way, RBB still 'employing people and solving problems.' When RBB Systems started out in 1973, it was a different kind of company, and after four decades the business remains successful because of a willingness to be different and not remain the same. October 2013 - One manufacturer's competitive advantage. In a tough manufacturing economy, finding the right market niche and sustaining an unfailing focus on customers are two reasons for the continued growth of RBB Systems, an Ohio-based electronics manufacturer specializing in recurring small batches of circuit boards and control panel assemblies. Bruce Hendrick Featured as a Daily Record "Newsmaker"
October 2013 - Bruce Hendrick, CEO of RBB Systems and Organizational Development Services, wears many hats. Literally. He is generally a recognizable figure. He's the guy in the hat. Hendrick first put on a hat because he liked the way he looked in it. Apparently, he wasn't alone. 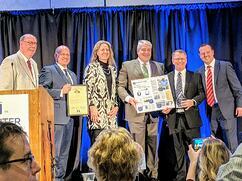 May 2013 - RBB was among an elite group of 101 Northeast Ohio mid-sized companies to be recognized at The 2013 Leading EDGE Awards on May 23 at Lorain County Community College in Elyria, Ohio. In its seventh year, this prestigious award was developed by The Entrepreneurs EDGE to recognize value-creating, mid-sized companies in the region. February 2013 - "Bruce Hendrick stepped in and saved RBB Systems." As a recipient of the Smart Business Evolution of Manufacturing award, Bruce Hendrick committed RBB to transform itself from a contract manufacturing "one-stop shop" into a laser-focused offering that satisfied a very specific market need. On August 10, 2011 - Cascade Capital Corporation chose RBB to be one of their prestigious 2011 award honorees for achieving superior growth in sales and/or employment over the past five years. To learn more about the award, read the official award letter, or view Bruce Hendrick's nomination essay to learn more about RBB's accomplishments, please follow the links in the text above. February 2011 - On Tuesday, February 22, the President and members of his cabinet traveled to Cleveland, Ohio, where the White House convened a Winning the Future Forum on Small Business in association with Cleveland State University and northeast Ohio economic development organizations JumpStart and NorTech. In his State of the Union address, President Obama spoke of the need to out-innovate, out-educate, and out-build our competitors in order to sustain our leadership and secure prosperity for all Americans. The Forum was an opportunity for the President and his economic team to hear directly from small business owners and leaders about their ideas for how America can continue to grow the economy, put Americans back to work, and win the future. February 2010 - After more than 30 years of doing business much the same way at RBB Systems Inc., Bruce Hendrick, the company’s president and CEO, decided it was time for a change. And this wasn’t going to be a minor tweak or just a fresh coat of paint. It would be a transformational process that would touch every aspect of the business. July 2011 - RBB reinvents itself one more time with a new business plan to receive a refinancing package. Because of the change, they saw a revenue increase of 25 percent in 2010 and expects a 10 percent increase in 2011. The company currently employs 60 people in Wooster, OH. March 2011 - The need for good accountants. There are plenty of competent accountants out there, Savron says. But the best ones bring something intangible to the relationship: a high level of passion for their clients’ success. Bruce Hendrick, president and CEO of RBB Systems Inc. in Wooster, agrees. Changing accountants a little more than a year ago has helped his company on a number of fronts. March 2010 - Bruce Hendrick was following a mantra from an Intel executive. Richard Seaman was looking for a method to improve the quality of his first run yields. Whatever their motivation, the steps implemented by the two local business leaders to streamline the efficiency of their companies when the economy was strong during the mid-2000s are a big reason why both not only survived 2009's global financial crisis but came out stronger in 2010. March 28, 2010 - RBB's Bruce Hendrick was interviewed by a local newspaper about positive economic impact. February 2008 - "If I listed everything they (RBB) has provided for our school over the past 35 years, it would fill a book," said Gary Wilmer. Ross Lilley, project specialist, and CEO Bruce Hendrick represented RBB Systems at the ceremony in February. September 9, 2007 - After RBB Systems Inc. experienced growth in 2000, company leaders established a facility in Wooster a year later to complement its Shreve operations to handle increased orders for high-tech circuit boards. The company enjoyed unprecedented growth and nearly doubled in size. Leadership in Transition at RBB Systems, Inc.
December 2007 - RBB accumulated over seven consecutive years (1,200,000 work hours) without a lost-time injury. At a luncheon in April of 2008, The Ohio Bureau of Worker's Compensation recognized RBB Systems with its Special Award for Safety. According to Bruce Hendrick, RBB's President and CEO, "To say I am proud of our accomplishment in this critical area of our business would be a major understatement! Seeing people head home in the same condition they arrived in the morning is just another wonderful aspect of working here that we all share. My sincerest thanks go out to all our great employees for your help. Safety truly is a team effort like no other." October 2005 - Tucked in the woods, down a couple winding roads and past a few horse-drawn buggies sits RBB Systems... Founded in 1973, the business has grown into a company with nearly 100 employees and two facilities one just outside of Shreve, and the other off Lincoln Way East in Wooster.